Nord America zur Ubersicht der Entdeckung, Eroberung und Colonisation. 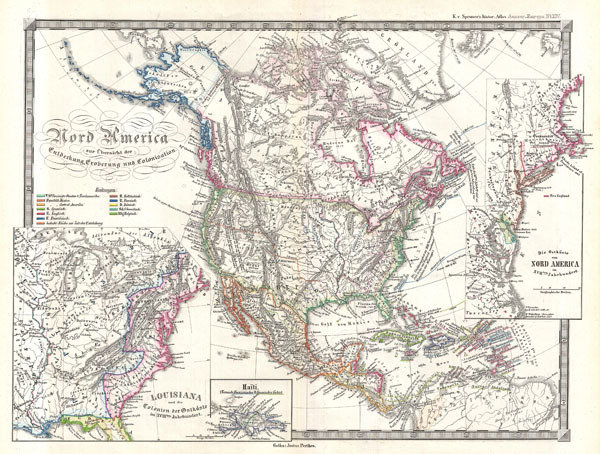 This is Karl von Spruner's 1855 map of North America, with an overview of its 'discovery, conquest and colonization.' Nation states, European possessions, and overlapping indigenous peoples' territories are named and color coded, with historical notes appearing throughout. This map is especially noteworthy for its treatment of the southwest. Mexico and Upper California are defined as a single large territory with the California Gold Region noted. Spruner also includes an interesting notation regarding the mysterious location of Aztlan, the legendary homeland of the Aztec peoples. Three inset maps are included: clockwise starting on the far right, The East Coast of North America in the 17th century; at the bottom middle, Haiti showing its French/Spanish boundary, and in the lower left corner, Louisiana and the East Coast colonies in the 18th century. Relief is shown by hachures, and the finely engraved detail throughout exhibits the exquisite craftsmanship for which the Perthes firm is best known. Justus Perthes published the map as plate number 14 in Dr. Karl von Spruner's 1855 Historisch-Geographischer Hand-Atlas zur Geschichte Asiens, Africa's, America's und Australiens, also known as Histor. Atlas. Ausser Europa. Phillips (atlases) 151. National Library of Australia, MAP Ra 140 Plate 14.